If high school was the best time of your life, and you feel like that’s when you met your best, lifelong friends, High School Revenge Murder Mystery is for you. As soon as you enter the door at the Artists’ Exchange on Rolfe Square, the energy and excitement hit you. You’ll never be so warmly welcomed at any other reunion you attend. There’s plenty of upbeat attitude to spare. You too can share in the fun, especially if you just play along and let yourself enjoy. You can even sing along with the old school fight song – lyrics are provided. You’ll recognize the usual “types” of people who populate any high school. There’s the fashionista Tina Manning (Jessica Chace), the eternal wise guy Zack Foster (David Kane), the rock star Dwight Dingley (Tom Chace), the emotional, trying-too-hard Amy Wallace (Anna Correa), and many more. The Class of 1996 of the fictional Sprague High School is hosting the party with members of the current class and future classes involved. Every detail has been prepared right down to the Reunion Weekend Schedule of Festivities and Activities (which doubles as the program). Get a balloon animal, pop into the photo booth with a friend, buy a cupcake at the bake sale, and make sure you pick up a copy of the trivia quiz. The Revival Brewing Company is the sponsor and serves beer, available for those over 21, at the show. High School Revenge Murder Mystery is the brainchild of the talented Jessica Chace, the artistic director, and Tom Chace, the musical director at the Artists’ Exchange. Jessica also directed the show and Tom wrote all the songs, including the school fight song. The high-octane reunion also celebrates the Hip with Humanity cast (a smash show by the 1996 class) and upcoming tour. The younger students are also hopeful to begin a junior version so they can bring the arts into school. The celebration is well underway when two gun shots are heard. A wounded alum staggers to the main stage and collapses, and the murder mystery begins. Audience members are very much into the game, enthusiastically searching for clues, questioning suspects and choosing whom they think is the culprit, booing and clapping where appropriate. Many suspects have motive, but only one has the right opportunity as well. It’s a multi-media presentation with a special surprise guest making an important video-taped appearance. Be sure to wear comfortable shoes because the clues are scattered throughout both levels of the Artists’ Exchange, and you don’t want to miss anything! 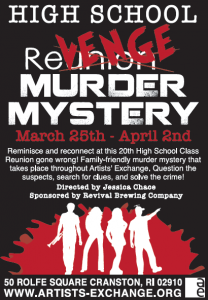 High School Revenge Murder Mystery continues at the Artists’ Exchange, 50 Rolfe Square, Cranston, through April 2. 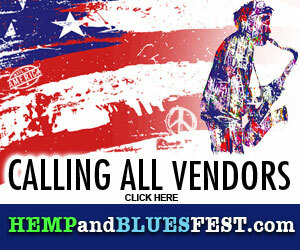 For tickets and show time information call 401-490-9475 or visit their website at artists-exchange.org.